The following guest article is a follow-up to a piece by Chuck Marohn written three and a half years ago in the wake of the shooting of Michael Brown. What we observed then remains true today: The auto-oriented development pattern playing out in declining communities like Ferguson is a huge financial experiment with massive social, cultural and political ramifications. This deep dive by St. Louis resident, Aubrey Byron, explores the problem further. In 2014, my Missouri city dominated the news cycle after the police killing of Michael Brown. St. Louis and Ferguson — the suburb just north of the city and site of the incident — became ground zero for a conversation about police brutality, race, and declining cities. The coverage at the time reported everything from Brown’s “character” to the tired homicide rates in St. Louis (it should be noted, without ever bringing up the reasons why those statistics are not reflective of the area as a whole). It was Chuck Marohn at Strong Towns who wrote a comprehensive piece providing context to the decline in Ferguson, drawing the important hypothesis that decline creates poverty rather than the reverse. A city with a limited budget fails to provide resources and infrastructure its citizens need to prosper. He cited key reasons Ferguson has put investment in the wrong places — such as strip mall stores with bleak employment levels — and how the city has failed to accommodate a public which uses walking as a means of transportation. Ferguson’s infrastructure investments (and lack thereof) create a clear picture of the failed suburban experiment. The two main roads running through the city are South Florissant and West Florissant. These streets run parallel but embody different economic samples of Ferguson. South Florissant features a revitalized downtown district with small businesses, some sidewalks, and some clear infrastructure investments like benches and streetlights. While it is still automotive-centered, steps have been taken to make this a more equitable and mobile urban environment. On the other hand, West Florissant, (ironically sitting to the east) is a dangerous stroad with few and narrow sidewalks. Desolate strip malls — empty as often as not — run along West Florissant next to high speed traffic. Few crosswalks with faded, if any, paint mark its cross streets. This was the site of many protests in 2014 and continued Black Lives Matter movements today. Sidewalks on West Florissant are both narrow and well-used. Despite the frequent presence of people walking on these sidewalks, they fall below the Americans with Disabilities Act (ADA) standard of 5 feet in width. They are often jutted and nonadjacent, separated from high speed traffic by small curbs. They connect various strip malls, infrequent bus stops, and empty lots. The now infamous Quiktrip that became a focal point of the Michael Brown story was also on West Florissant at the time. It has since been burnt down, a result of the protests that followed the lack of indictment of Officer Darren Wilson. The space was repurposed as a community center with resources for citizens including higher education and advocacy groups. It is clear that most motorists on West Florissant are using the street as a cut-through between two highways and two larger cities — Florissant to the north and St. Louis to the south. The wide roadway serves cars in transit but does little to offer economic prosperity to the region. It seems unlikely the massive streets are doing much to support the small local businesses on this stretch of stroad, rather than the people driving through. Yet, that is exactly who the infrastructure is catered to. In the primarily black neighborhoods behind the Quiktrip site, there are sometimes narrow sidewalks and even more frequently, no sidewalks at all. While originally designed as cul de sacs, many of the sidewalk-less streets are used for through-traffic and are without traffic calming measures. High speed motorists pass families and residents making their way to work, and many citizens find the situation frustrating. “There need to be lights!” said Stephanie, a resident of the neighborhood. She held the hands of two small children in her driveway as she spoke with me. Of the people who live there, she said, “They have to [walk in the street]. Then people be flying down here and they have to jump out of the way of the cars.” The danger of walking in the street without viable sidewalk infrastructure becomes compounded by the dark, unlit conditions at night. It was, after all, the fact that Mike Brown had been walking in the street that became evidence to police of his apparent criminality. Yet, as I precariously biked around Ferguson, I saw that walking in the street isn’t just common occurrence but a necessity when roads have few, scattered and often disappearing sidewalks. Of the city’s $21 million dollar budget, just $3,000 was dedicated to sidewalk maintenance in 2016. The budget allocation grew in 2017 to $7,000 and some curb improvements can be seen along Carson, on the westside of historic downtown Ferguson. Unsurprisingly, these rare upgrades were afforded to a more affluent, whiter area of town than where Mike Brown lived and traveled. For 2018, the budget will allocate just $3,500 to sidewalks. It’s also worth noting that the bulk of that budget is accounted for by fines and fees, which, according to Arch City Defenders, disproportionately affect the poor. So what exactly is Ferguson spending its budget on? Like many cities, personnel expenses account for the largest share of expenditures. Because St. Louis City and County operate as separate entities — unlike most metropolitan areas in the country — there are often overlaps in expenses. Another $2 million in the 2018 fiscal year was budgeted for debt services. This includes TIFs (Tax Increment Financing) aimed at pursuing growth. These are strategies often used by declining suburbs to attract businesses to the area. The city budget shows that chasing growth is a much higher priority for Ferguson than basic maintenance and services. In Austin, the city has calculated the complete cost of building new sidewalks at $18 per square foot. That means the current Ferguson budget, if paying for a sidewalk 5 feet wide, would result in just 38 feet of sidewalk. This would cover far less than one city block and in some instances, not even one lot. Even by cutting costs and narrowing sidewalks to the point of being almost unusable, Ferguson could not come close to developing a viable walking network at its current budget level. Even main streets with sidewalks like Chambers Road, a key East/West running thoroughfare in Ferguson, continually fall short of the 5 foot basic sidewalk standard. Despite being one of the few streets in Ferguson with a bus line, crosswalks can sometimes be as much as a half mile apart. This leaves pedestrians to navigate without signals across five lanes of traffic. “If people in the community are using any kind of transit (bus or train) they need a good walking network to get them to that transit,” said Walker. “For too long we have been building massive infrastructure that we cannot afford,” she says. Without a substantial investment in walking infrastructure, it’s clear walking conditions will continue to be unsafe for residents. It’s not simply the lack of funding and sidewalks in Ferguson that tell a story, but precisely where the sidewalks lead and don’t lead. Signs along Hudson Road read “Watch For Pedestrians” on a sidewalk-less street. 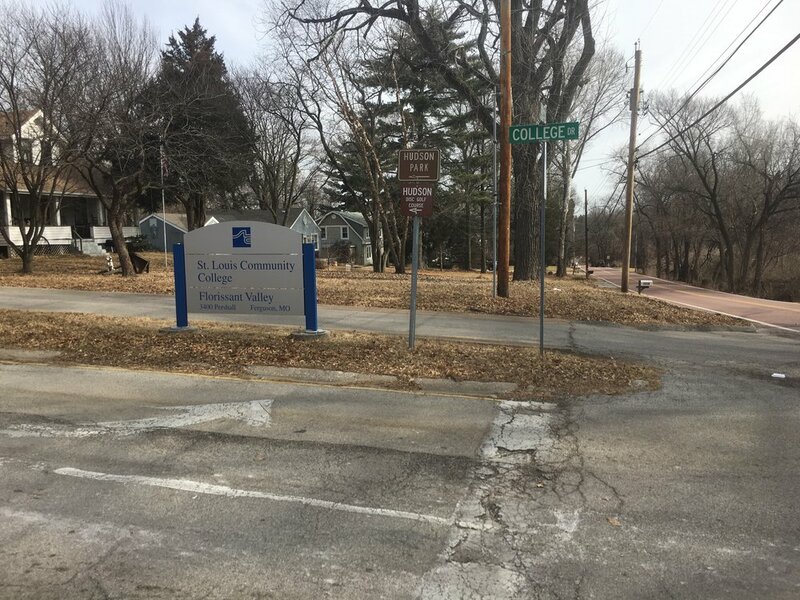 Incidentally, Hudson is one of two main roads which lead to St. Louis Community College’s Florissant Valley location within Ferguson city limits. The auto-centric traffic creates a further barrier to the most affordable higher education facility in the area in a city where just 20% of the population over 25 years of age has higher than a high school diploma. Other education facilities are left out, too. Griffith Elementary is surrounded by winding streets without sidewalks. The main road in front of the school does have sidewalks, but they are very small — between 36 and 42 inches wide. Sometimes they are obstructed by utility poles and junction boxes, making the ways even narrower. Most neighborhoods around the elementary and nearby parks are without sidewalks as well. These neighborhoods include streets with blind turns and hills. Various signs in the neighborhood beg motorists to watch for children on blind hills and limited sight corners, but traffic remains an issue. Narrowing streets like Chambers and Hudson would help slow vehicles and better accommodate all types of traffic. An additional solution to streets that lack safe, frequent crossings could be Pedestrian Hybrid Beacons (PHBs), a model used in Austin. “They are dark until someone pushes the button to cross. When the button is pushed the light starts flashing yellow in warning, then goes to solid red for people to cross. Then it goes to flashing red, treated like a stop sign, then goes back to dark,” said Walker. PHBs would go a long way for pedestrian safety but with a price tag of $75,000 to install, they just become another example of how miniscule the Ferguson budget is. Another option to provide less expensive, safe walking networks is to create walking paths within the street, like the City of Seattle is currently doing. It is more cost effective than building sidewalks and it helps narrow the roadways. Unfortunately, this sort of in-street walking is also criminal in Ferguson. “Manner of walking” is a common charge employed by police in Ferguson and accounts for some of the budget obtained by fines and fees. It was one of the key charges found to be unconstitutionally applied by the Justice Department in their 2015 investigation. The department found the municipal code was cited to African Americans 95% of the time. It was this violation that led Darren Wilson to confront Michael Brown in 2014. The Ferguson Police Department declined to comment on the ongoing citation, “Manner of walking along roadway,” in the city. Failing to invest in sidewalks is a failure to invest in the very people who live in a community. If the city of Ferguson wants to climb out of the decline it is currently facing, it must take seriously the needs of its own residents, and that means starting with the most foundational need — to walk safely. Only a new mindset that focuses on building neighborhood prosperity from within rather than moving drivers quickly through this community can change that.